LifeWork Elements: What Do You Focus On In Sales? There are many times during the day, at work, or in our life that we tend to wander and lose sight of our goals, or what is in front of us. This can be especially true in sales, when we may get bogged down with the insignificant things, or sidetracked. Sometimes all it takes is a little focus to get back on track and do the things that are necessary for success. 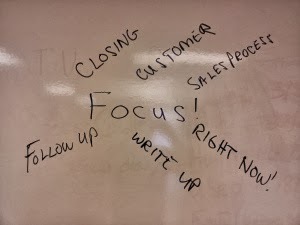 What do we focus on in sales? RIGHT NOW: The first thing you can do is focus on “right now.” What are the things you need to be doing right now? Drop the things that can wait and work on the important things. What are the important things—read on. CUSTOMER: Pay attention to your customers. Notice that customer when they walk in. If a phone call comes in, devote your full attention to it. Phone customers are a hot opportunity. If you are walking past a customer acknowledge them. “Hi, welcome to (business. )” Nothing is more important than a customer. SALES PROCESS: Many times when it is slow, or busy we tend to take short cuts. We lose sight on the sales process. Getting back to the basics allows you to regain focus of your sales process. Welcome-Interview-Presentation-Write-Up-Close-Follow-up. It is that simple. WRITE-UP: When we lose focus in sales many times we become a tour guide and forget to go for the order. , in different ways. If you have meet all of your customer’s needs with your product or service then focus on asking for the sale multiple times. CLOSING: Sometimes when faced with objections or a customer tells us “no” we have a tendency to stop and give up. Focus on closing. Turn that objection around into a closing question. When a customer says no, focus on asking, “why not?” Don’t give up. FOLLOW-UP: To build customers for life, focus on follow-up. If all you do is focus on conquest sales then you won’t build up a good client base that repeats and refers. Focusing your energy and time nurturing the customers you already have will build a strong loyal customer base. So, focus your efforts on genuine follow-up and good customer service. Focusing your efforts in these areas will help you to a great career in sales. So, get out there and focus your efforts starting right now!